April 14 will always remain a red letter date in the MLS history of the Portland Timbers. It's hard to fathom just seven years ago on this date, the Timbers played their first ever MLS match at home and under a wild rainstorm, Portland won its first ever match in league play over the Chicago Fire in thrilling but nail biting fashion. Because of stadium renovations at JELD-WEN Field to turn the former multi-purpose stadium into a soccer/football venue, the Timbers spent most of February and March away from the Rose City until their epic home debut. With the Timbers expanding their stadium to include a full east side façade over the next two years, the 2018 MLS home opener for the Timbers was again delayed until the 6th match of the year on the same date as their inaugural MLS home match . 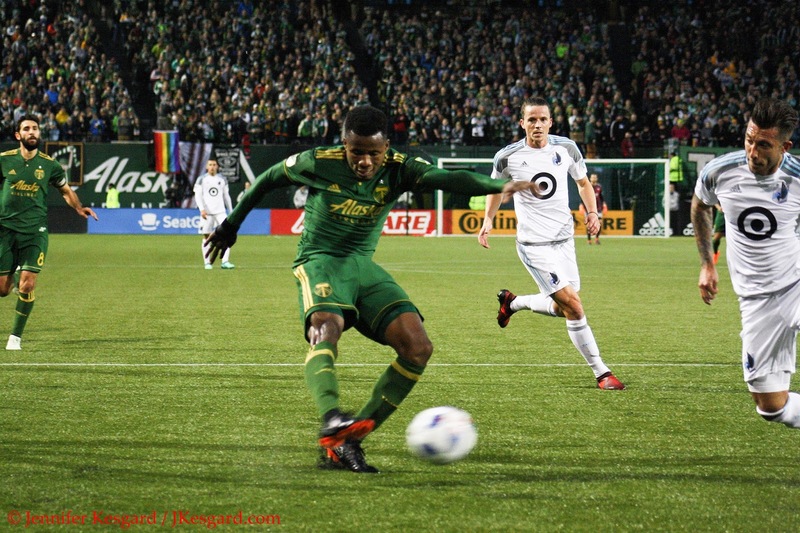 Facing similar weather to that night with many other similar events taking place, the Timbers hosted Minnesota FC, the team that helped them open Providence Park for the 2017 MLS season. While the Loons struggled mightily last year, the spunky visitors held up against a Timbers side still trying to find their way under new coach Gio Savarese. While the Timbers sent the fans home happy with a thrilling 3 to 2 victory under a cold drizzle, there were also a ton of questions that still need to be addressed before this team can progress to the elite of the MLS West. Getting Gio his first win of his MLS coaching career, however, was a nice reward for the home team who started out like they were going to run the Loons out of the stadium, similar to what happened last year. The Timbers raced to a 2 goal lead in the second half only to watch Minnesota pull one back in the 79th minute before Diego Valeri and Fanendo Adi tallied 3 goals late to post an impressive 5 to 1 win. For this edition, the Timbers again raced to the 2 goal lead within the first half an hour, and when Minnesota thought they had pulled to within one, the offside flag negated their goal. Minnesota kept pressing until they scored in the 64th minute to ramp up the pressure. Adi nearly replicated his 2 goal performance with tallies in the 74th and 78th to push the lead to 4 to 1, but the offside flag took away the latter goal. Unlike the 2017 edition, Minnesota received an own goal in the 82nd minute to make things interesting, then pressed a beleaguered Timbers defense with pressure until the final whistle. While the Timbers did hold on and get their first win of 2018 at home, the defensive woes and offensive stagnation late nearly cost Portland for the third straight week. 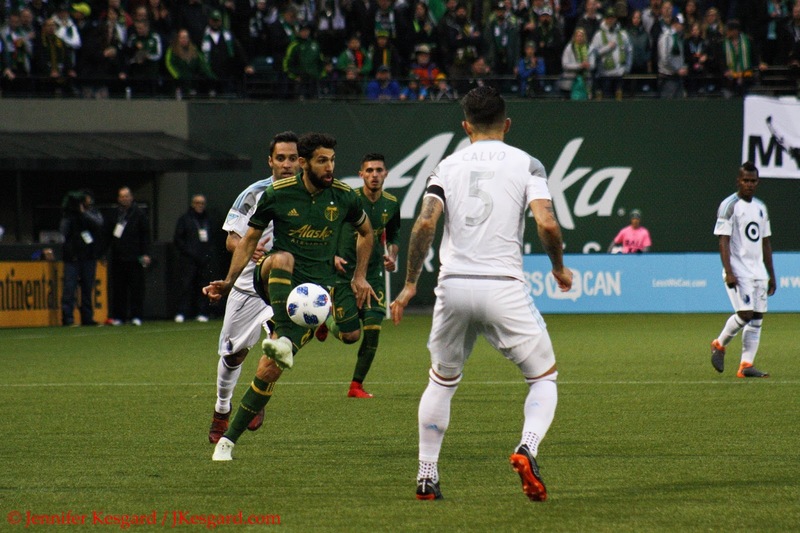 Portland had Chicago and Orlando both beaten in their last 2 matches, but the Timbers ended up conceding late in Chicago for a draw, while a 3 goal onslaught by Orlando in the final 10 minutes last week turned an impressive win into a gut wrenching defeat. 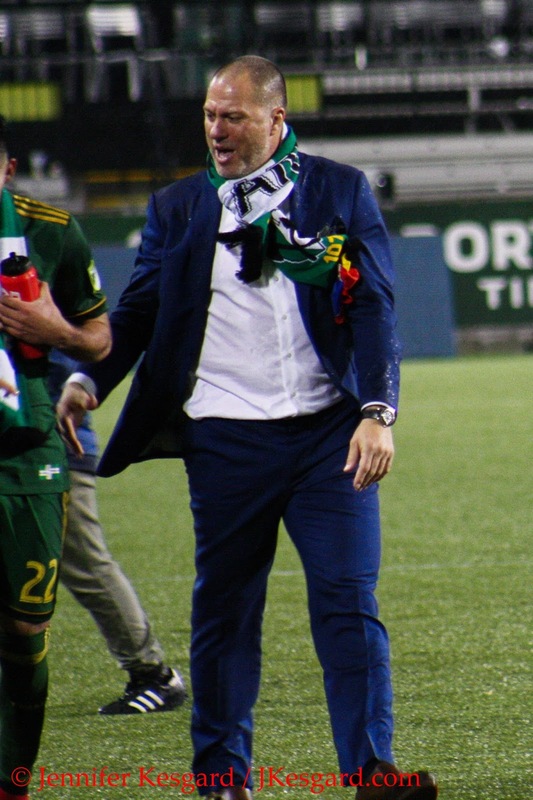 Savarese has wanted the Timbers to employ more pressing and ball movement in his style of play, but after being dismantled by the New York Red Bulls in game 2, he's been forced to make some significant alterations to that plan. Instead of using veteran Liam Ridgewell along the backline, Savarese has employed Bill Tuiloma alongside Larrys Mabiala as the center backs while also using a 4 defender, 3 defensive midfielder, 2 attacking midfielder, 1 forward lineup - also known as the Christmas Tree formation. The tree was back for Minnesota, as Tuiloma and Mabiala lined up with Alvas Powell and Zarek Valentin as the defensive line in front of goalkeeper Jake Gleeson. While Cristhian Paredes, Diego Chara and Andy Polo made up the defensive midfield line, Polo was employed to press more forward as a supporting wing and drop back on defense to help Chara and Paredes. With Adi slotted as the lone striker and Valeri paired up with Sebastian Blanco as the attacking midfield, it appeared that Savarese had the strongest available attack at his disposal. Savarese could bring on Samuel Armenteros, Jack Barmby, Andres Flores if the offense needed help, or use Jeff Attinella, Marco Farfan, Julio Cascante or Lawrence Olum if the defense needed fortifying. Minnesota has been a rather up and down team early in 2018, but much improved over their initial MLS season last year as Coach Adrian Heath has seen a massive influx of talent across the board. While the attack took a hit when Kevin Molino was lost for the 2018 season due to injury after he had scored 2 goals in 2 matches, the Loons still have several players that can be dangerous in the right spots. Darwin Quintero is regarded as a highly accomplished scorer as the team's first ever Designated Player, while Christian Ramirez, Miguel Ibarra and MLS veteran Ethan Finlay give MNUFC options. Ibson and Rasmus Schuller give the spine some teeth, while another MLS veteran, Matt Lampson, has emerged in goal for the club. Considering MNUFC has wins over Chicago and Orlando City this year, Portland couldn't overlook the challenges their visitors presented one bit. This was a different club from the group that was ransacked to start 2017, and Heath has been able to employ a style that gives them confidence and danger. For Savarese, he could be pleased the Timbers were showing some fight to get draws versus FC Dallas and Chicago with some improved play, but the memory of coughing up 3 goals in 10 minutes versus Orlando was lingering over his group. Fanendo Adi added his name to the 2018 scoring log with a second half goal. After the Timbers Army continued their tradition of singing the National Anthem, which started on that fateful night in 2011 and has remained for every MLS home opener since, the two teams started the first 20 minutes trading back and forth runs with Adi and MNUFC defender Jerome Thiesson both having quality shots blocked. The battle continued until the 20th minute when Powell took an outlet pass from Mabiala and tried to move on the right side near the half line, and the MNUFC team was happy to oblige. What followed was an end to end run where Powell didn't pass the ball nor get stopped, and after a stepover fake to make the defense pause, he launched a right footed volley that found nothing but net. It brought the stadium to its feet in celebration, and the frenzy continued when after Polo had a shot blocked in the 23rd minute, Powell collected a pass from Paredes to cross into the box. The ball glanced off Ibarra toward goal, and it was Valeri who shook his mark and was first to the ball for a deftly placed shot into goal for a 2 to 0 lead. Ibarra thought he had brought his side back just 2 minutes later off a cross from Thiesson past Gleeson, but after center official Jose Rivero didn't waive off the goal, the VAR review ruled Ibarra was offside and waived off the tally. Blanco struck the crossbar in the 30th minute off a solid sequence of passing, but the Timbers weren't able to add anything more to the lead. Gleeson, however, denied Ibarra in the 42nd minute when MNUFC defender Marc Burch put a cross into the box and Ibarra headed it towards the left post. Gleeson was able to push the ball clear for a corner, and the Timbers were able to clear out the remaining threats to keep the lead at 2 to 0. The first half statistics showed the Timbers with advantages in several categories, but Minnesota was enjoying more possession and solid passing accuracy although they weren't getting much done in the final third. 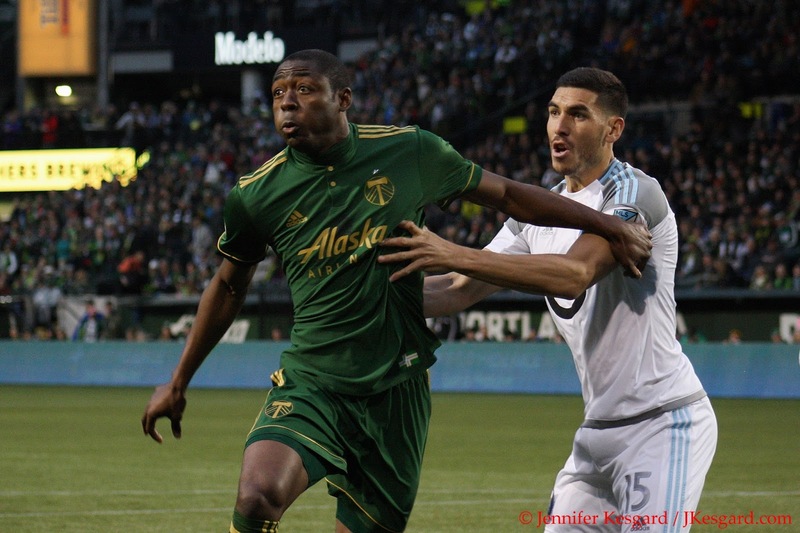 While Polo's speed was causing plenty of coverage issues for MNUFC, the Timbers were also leaving Mabiala and Tuiloma to cover the backline and threats as Powell was pouring forward nearly at will to aid the offense. While Valentin stayed behind to help out on the press, there were a few moments of miscommunication amongst the defense that could have been a lot worse. Heath replaced Burch with rookie Carter Manley at the break, and the change seemed to have opened up more space for MNUFC. With the rain slightly subsiding, the teams traded possession and runs to start the second half until the 58th minute when Gleeson leaped up to push away a Ramirez chance from close range with a lovely reaction save. MNUFC kept up the pressure and the dam finally broke when Quintero slotted home a shot in the 64th minute off a thrown in when he spun past his mark, and beat Gleeson with a tight angled shot. Quintero and Ramirez had notable chances in the 72nd and 73rd minute until Portland extended their lead. Blanco moved the ball from left to the right post for Valeri, who dropped a pass right to a waiting Paredes. His bouncing shot spun past the MNUFC defense to find Adi's head and he calmly pushed it past a lunging Lampson to restore a 2 goal lead at 3 to 1. Adi thought he had another brace in the 78th minute when he muscled past a defender to slam forth a shot past Lampson, but upon VAR review, it was ruled that Adi was offside on the pass and the goal was waived off, so the score remained 3 to 1 with 12 minutes left. Savarese had gone to his bench in the 74th to replace Polo with Andres Flores to switch up the Timbers into a more defensive mindset, but the plans started to crumble in the 81st minute when Quintero put a cross into the path of MNUFC substitute Abu Danladi with Gleeson slow to react. Tuiloma was first to the ball, but instead of clearing it away, the ball was bumped past Gleeson into the net for an own goal. The final minutes saw Minnesota threated with various runs about the Timbers defense, and Savarese brought on Marco Farfan for Blanco to further bunker down. It appeared that Quintero's goal had rattled Gleeson a lot, and the pressure that had been building all match toward Mabiala, Valentin, Powell, and Tuiloma was causing a lot of miscommunication and mistakes. Had Minnesota been more purposeful with some of their runs to exploit space better, the results here might have been different - but Portland did just enough to hold off the rally and earn their first 2018 victory. The possession numbers were decidedly in Minnesota's favor in the second half, and when they brought on Manley for Burch, the move was done to try and neutralize Powell's movement forward. In the first half, Alvas was a huge part of the offense, but in the second half, he was forced to stay back more and defend which cut away from the attack. Portland now had another home match on April 22nd when New York City FC visits with one of the heroes from the 2015 MLS Cup Timbers side, forward Rodney Wallace. For my money, the players of this match really fell upon Blanco, who was very effective at exploiting space, Valeri, who created something out of little with his goal, and Powell, who was the best offensive threat in the first 45 minutes. I liked Adi's work later in the match, as he became more of a threat later in the match once Minnesota was forced to press forward being down by two at the break, but it would have been great to see more of that earlier. With Vytas nearly healthy after suffering a thigh injury, David Guzman rehabbing after injuring a knee on international duty, and Gleeson being a bit jittery in this match, I'm expecting some changes in the starters and game day roster by Savarese, but we will have to wait to see the midweek updates to confirm who is actually available for next Sunday. While it wasn't pretty at points - Gleeson looked lost at points and failed to organize his defense better, and the Timbers were forced to bunker - the resulting win should give them some much needed confidence.